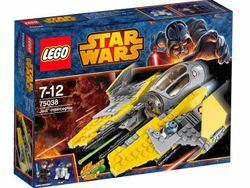 75038 Jedi Interceptor is a Star Wars set released in 2014. The set contains Anakin Skywalker's yellow Eta-2 Jedi Interceptor, R2-D2, and Anakin Skywalker with a new face featuring him wearing a headset. This is a description taken from LEGO.com. Please do not modify it. (visit this item's product page) Come to the rescue with Anakin and the Jedi™ Interceptor! Load up Anakin Skywalker™ and R2-D2™ into the agile Jedi™ Interceptor with opening cockpit, folding wing flaps and new dual spring-loaded shooters. Then take to the stars and rescue Palpatine™ from the clutches of the evil confederate forces! Includes Anakin Skywalker minifigure with a Lightsaber and R2-D2. Facts about "75038 Jedi Interceptor"
Come to the rescue with Anakin and the Jedi™ Interceptor! This page was last edited on 26 December 2017, at 10:46.